Get Rehab Valuator Premium software here if you don’t already have it. Watch our New Construction Budget video for a tutorial on how to analyze lots and new construction deals. Price deals, market your wholesale deals. Buying wholesale lots works for land AND rehabs! Watch this video to learn how to wholesale real estate today. I thought I was helping you by showing you this training 🙂 Where are the lots? Are investors building new construction in that area? Also, Lorenzo, if you own these lots, you’re technically not wholesaling them anymore. You own them. Why not build on them yourself if the market makes sense? Very well done Dan and Chris. Great content. That’s what I like to hear, Rocky! Glad you stumbled on us as well! I have a patent steel system , built two houses and like to go back and built more very affordables houses , I would like to build 10 houses at the same time , need to get some help . 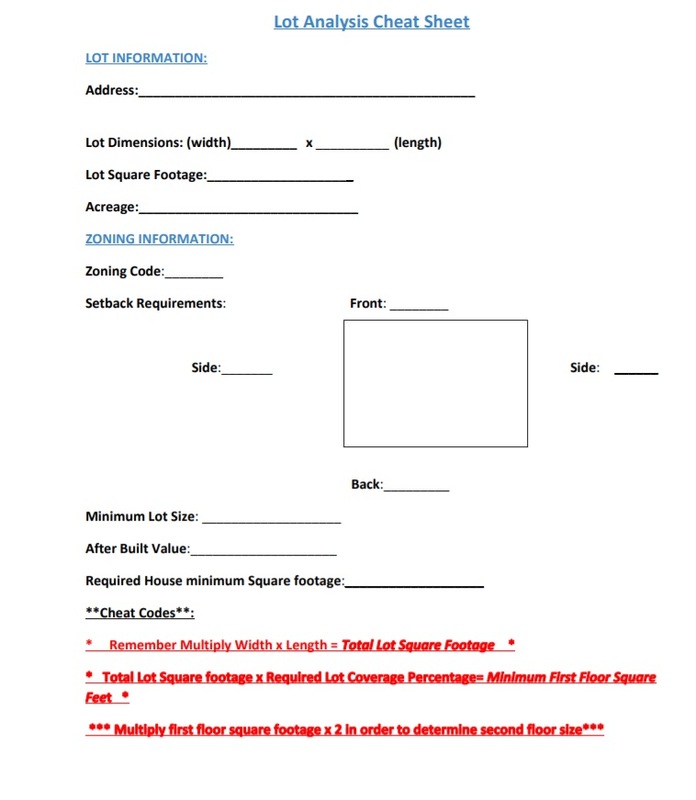 Thanks for the timely info on wholesaling lots. I’m working with a builder of in fill and I will be able to ‘earn’ my wholesale fee. I was able to download the cheat sheet, but there was no indication to print nor could I turn it into a document I could save. In addition, as I understand the last cheat code ‘multiplying the first floor sq. footage by 2 to get the second floor size’ doesn’t make sense. I think that is the total sq. footage instead. interesting. I have rentals and they keep me pretty busy. I have thought about lots but only in passing. Sorry missed your show. I am planning to flip infill lot deals to you and Chris. The training on wholesaling infill lots was excellent.I am making offers to sellers who owe back taxes.Targeting out of state owners first,followed by in state owners. A seller client’s son owns some land and I’d like to know the fundamental steps to go through to discover highest a best use first. I thought I might go to the city planner to find out it’s current master plan (so that this land will not interfere with that master plan), and then move forward with finding out how to evaluate (run a vacate lot CMA), but I don’t want to get fleeced by bringing in someone more experienced than me. Very helpful, and awesome content as usual. Cleared up a lot for me. Thanks again. Can’t see the video of google maps you are referring to. Is there a youtube video available of thsi webinar? I am happy to help. There is no Youtube video of this webinar. What specifically is the issue that you are having when trying to watch the video?